The hit series returns to charm and inspire another generation of baby-sitters! Mary Anne has never been a leader of the BSC. So when a fight breaks out among the club's four members, Mary Anne feels a little lost, unable to depend on Kristy, Stacey, or Claudia anymore. 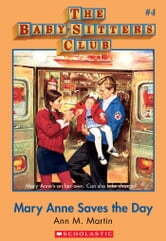 Sitting by herself in the cafeteria is bad enough; when Mary Anne has to baby-sit a sick child without any help from the club, she knows someone has to take action. It's time for Mary Anne to step in and save the day! The best friends you'll ever have--with classic BSC covers and a letter from Ann M. Martin! A grat book, I think that wen I'm a baby sitter it will help me.P.S. I'm 9/10. It's full of sepense. I loved it!! !